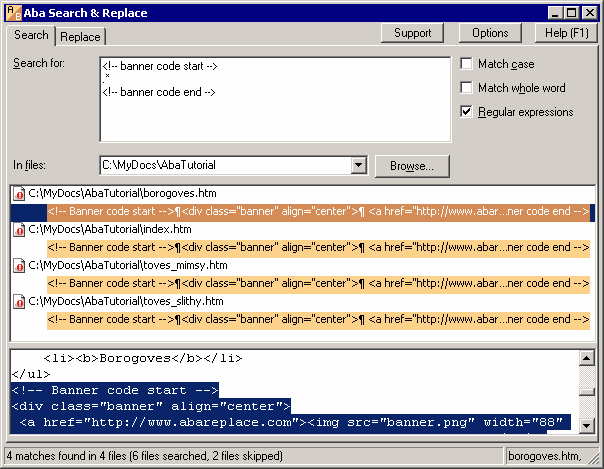 Aba is a tool for replacing text in multiple files. With Aba, you can quickly correct errors on your web pages, replace banners and copyright notices, change method names, and perform other text-processing tasks. Features: "search-as-you-type" interface, multi-line search and replace, regular expression support, Unicode support (UTF-8 and UTF-16). Preview the results in context before starting the replacement, Fast and easy-to-use search. * styling your buttons, table cells, etc. (e.g., adding 'class=button' attribute to each ). * renaming a class, method, or function and even adding or removing method parameters. Qweas is providing links to Aba Search and Replace 2.3 as a courtesy, and makes no representations regarding Aba Search and Replace or any other applications or any information related thereto. Any questions, complaints or claims regarding this application Aba Search and Replace 2.3 must be directed to the appropriate software vendor. You may click the publisher link of Aba Search and Replace on the top of this page to get more details about the vendor.